Sackets Harbor had been almost stripped of troops for the raid on York (Toronto) in late April and for reinforcing the army at Fort Niagara in preparation for the recent assault on Fort George. At Kingston, across the lake, Sir George Prevost, the Governor-General of Canada, had assembled a force of 800 British Regulars in addition to militia. Taking advantage of the absence of Chauncey's fleet, which was at the other end of the lake, Prevost launched an attack on Sackets Harbor with his entire force of Regulars on the night of May 28. About 400 Regulars and approximately 750 militiamen, under the command of Brig. Gen. Jacob Brown of the New York militia, defended the town. Brown posted his men in two lines in front of a fortified battery to cover a possible landing. Coming ashore under heavy fire the British nevertheless pressed rapidly forward, routed the first line, and pushed the second back into the prepared defenses. There the Americans held. The British then tried two frontal assaults, but were repulsed with heavy losses. While they were re-forming for a third attack, General Brown rallied the militia and sent them toward the rear of the enemy's right flank. This was the turning point. Having suffered serious losses and in danger of being cut off, the British hurriedly withdrew to their ships. On Friday the 17th a small British naval force arrived off Sodus Bay, New York. The following evening a small party of about one hundred men, including the Royal Scots, landed at Sodus Point to destroy military stores thought to be stored there. Unknown to the landing party the stores had been removed a short distance from the village and concealed. After finding the storehouses empty, the British threatened to destroy the village if the stores were not brought forth. A short skirmish developed between the British and a small local force. The British were forced to pull back, but before leaving, set fire to the storehouses and several other buildings. In the early morning of December 19th, 1813, a force under Colonel John Murray, consisting of detachments of the 100th and 41st Regiments, Royal Scots, Royal Artillery and Canadian Militia embarked in bateaux at the foot of a ravine up river. Crossing silently to a point above Youngstown, New York, they quickly and quietly attacked Fort Niagara killing or capturing its American garrison. The British attack under command of Maj. Gen. Phineas Riall came in the very early hours of December 30. Over 1,000 men crossed the river quickly and silently. The British force easily brushed aside American patrols and captured one of the artillery batteries then easily moved directly against the Village of Black Rock. American Gen. Hall hearing of the British landings marched virtually his whole force to meet them. By the time he reached Black Rock his forced had dwindled to a low of 600 men, fearing night battle and the war cries of the Indians. They, however, bravely engaged the British force but quickly broke and ran when Riall mounted an attack on their flank. The British paused a moment to set fire to the Village of Black Rock and then turned to the open road to Buffalo. Brief battles ensued then the British turned to the acknowledged purpose of the raid, the burning of Buffalo as the final act of retaliation for the destruction of Newark. The British soldiers proceeded up and down the streets firing the buildings. By 3 o'clock in the afternoon the entire town, with the exception of a half-dozen buildings, was a smoldering mass of ashes. Captain James Lewis Basden was in command of the British troops sent to intercept an American force. His troops consisted of companies of the 89th and Royal Scots Regiments, a company of rangers, a detachment of the Kent militia, and some native warriors. The total amount of men in this force was about 300. The Americans had a strong position and made it even stronger by constructing an abatis the night before. They also watered down the sides of the ravine, which made them very slippery. The Kent militia under the command of Captain Caldwell was sent to outflank the Americans to the north. The native warriors took the American right flank, and the regulars under the command of Captain Basden would try a frontal assault on the American position. This plan proved to be a disaster. The British force was cut down by rifle fire. When night fell the British retreated. The American commander knew that he could no longer take the British post at Delaware. That same night Captain Holmes having defended his position on the ravine withdrew his force to Detroit. The British force had 14 men killed and 52 wounded. The American force had 4 men killed and 3 men wounded. “Here on 5 July 1814 an American army under Major-General Jacob Brown launched the first major invasion of Canada during the War of 1812. The Americans defeated a British and Canadian force commanded by Major-General Phineas Riall consisting of regulars, militia and Aboriginal warriors. During the engagement about 200 men were killed and 500 wounded. After four months of heavy fighting, with major action at Lundy’s Lane, Fort Erie and Cooks Mill, the invaders were forced back to the United States." At Queenston General Brown conducted a council of war to determine future operations following the American victory at the Battle of Chippewa. The majority favoured an investment of Fort George. Subsequently on 15 July Generals Ripley and Porter were sent in two directions to reconnoitre the defences at Fort George in anticipation of a general attack there. Once the defences of the northern side of the fort were determined General Porter gathered his forces, pushed back the advanced British pickets and formed on the open plain within a mile of the fort. While engineers viewed the defences from a closer view, Porter’s troops on the plain were assailed by the guns of the fort. During this operation Lieutenant Colonel Tucker moved out from Fort Mississauga with a detachment of the 8th regiment, was joined by the few Royal Scots from Fort George, to attack Porter. A small engagement ensued with the only casualties being 2 Americans wounded. Porter successfully pushed back any troops sent out to dislodge him and eventually moved off to join Ripley. Mounted troops left on points along the road between his position and the lake were captured by groups of militia ranging in the area. 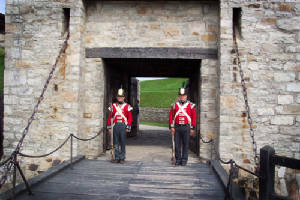 On 20 July the works at Queenston were blown up and the whole of the American force invested the area around Fort George. Nothing however came of the operation as Brown later received word that Commodore Chauncey was ill and would not be bringing the American fleet to Brown’s assistance. The operation was then abandoned and the army moved back to Queenston then further south to Chippawa where they camped on the former battleground of the previous victory of 5 July. The sight of the bloodiest battle of the War of 1812. On the afternoon of 25th July, 1814, Lieutenant-General Gordon Drummond with about 2800 men engaged the invading American army which had recently been victorious at Chippawa. The armies were evenly matched and the six-hour battle lasted until darkness and heavy losses put an end to the fighting. Each force had lost over 800 men. Although each claimed victory, the Americans had failed to dislodge Drummond from his position. They withdrew the next day, ending their offensive in Upper Canada. Following the carnage and confusion at Lundy's Lane the Americans backed up to Fort Erie and fortified their position there in anticipation of attack. General Drummond arrives and sets up batteries which begin opening salvos on the fort. In the early hours of August 15,1814 he launches a difficult military manoeuver, a night attack launched against different targets by separate columns. A well-prepared American defence and an explosion in the North East Bastion destroyed his chance for success with the loss over 1,000 men. A full scale siege set in and it was broken on September 17 when American troops sortied out of the fort to capture and wreck the British siege batteries. General Drummond had decided to abandon the siege on Fort Erie and pull back to Chippawa. Unknown to him however the Americans chose this same moment to make their largest sortie yet upon the British lines. A severe rainstorm conceled the advance of the Americans who succeeded in penetrating the British lines. During this forceful attack they managed to spike several cannon and destroy the blockhouses and entrenchments. British reinforcements were brought in to repel the advance. A severe fight erupted, employing most of the regular troops. Worried that an attack may come from across the Niagara river at Black Rock, General Drummond detailed the reserve troops to secure the riverbank and British camp.